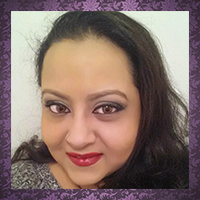 I'm thrilled to be here filling in on ColorSutraa from my usual gig as The Polished Hippy on Facebook. Now, for the most part I stick to plain jane manicures as I get mesmerized by the colors and am happy to wear one shade at once. But my assignment for this mission was nail art, so I thought why, not, time to try something different. So dear readers, you get to see my very first attempt at dotting! 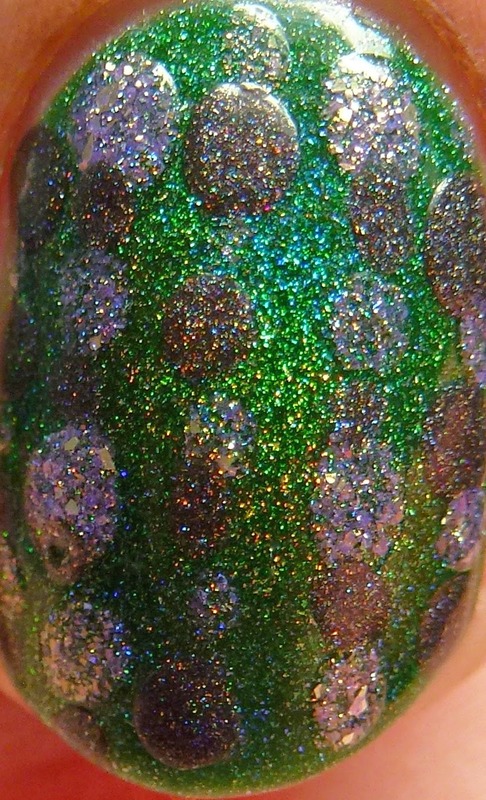 I went into this with a big 'ol security blanket in the form of some of my favorite holo polishes by Glittering Elements, Glitzkrieg War Paint, and Too Fancy Lacquer, so this shouldn't hurt too bad, right? First of all, I'll show you why I love dot manicures so much. I've been collecting antique Venetian beads since I was a kid and some of my favorites are known as "eye beads" in the trade. 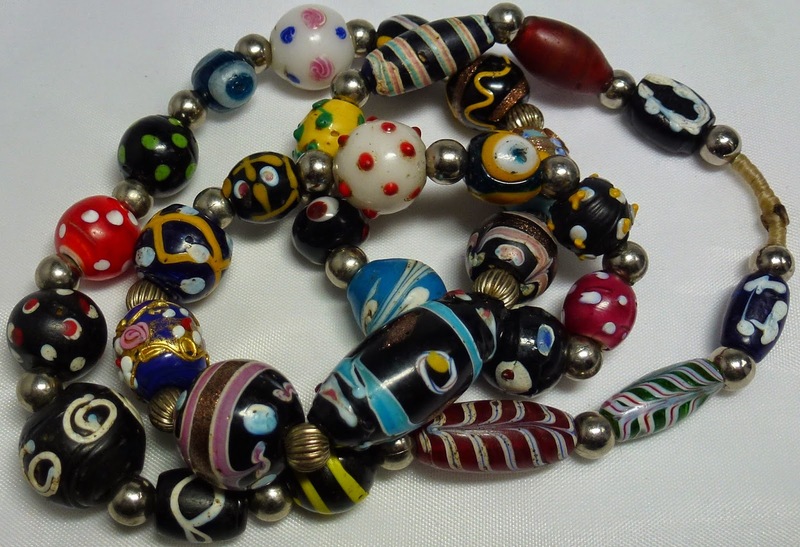 The part of Venice called Murano was at the center of the glass business since in the middle ages and beads such as these were sold all over the world. They were produced by melting glass canes around wires over open flames, hence the term "lampwork" for this method. 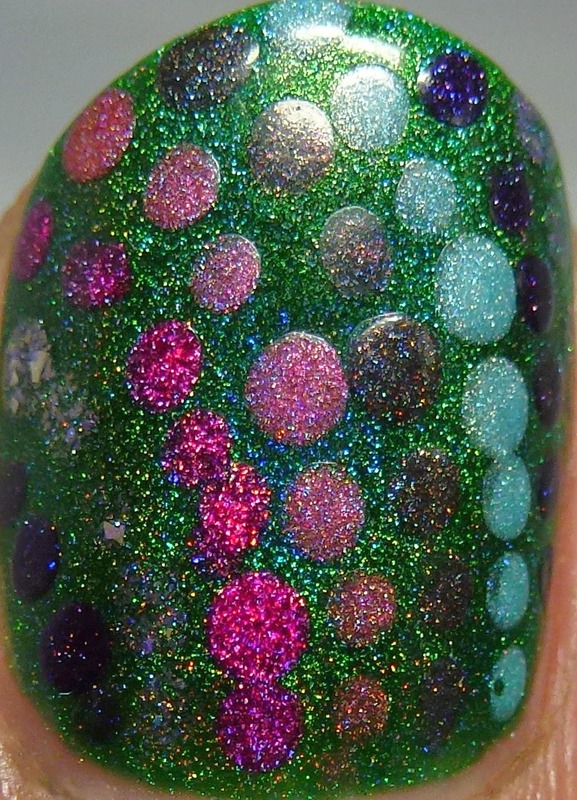 The dots on manicures always reminded me of my beloved "eye beads." Next, let me show you the colors I used. 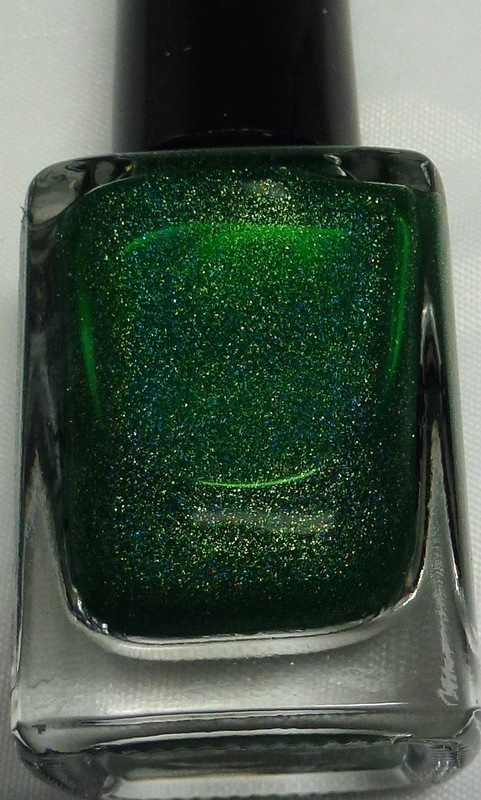 My base was Glitzkrieg War Paint Emerald, a glowing, translucent green jelly holo. 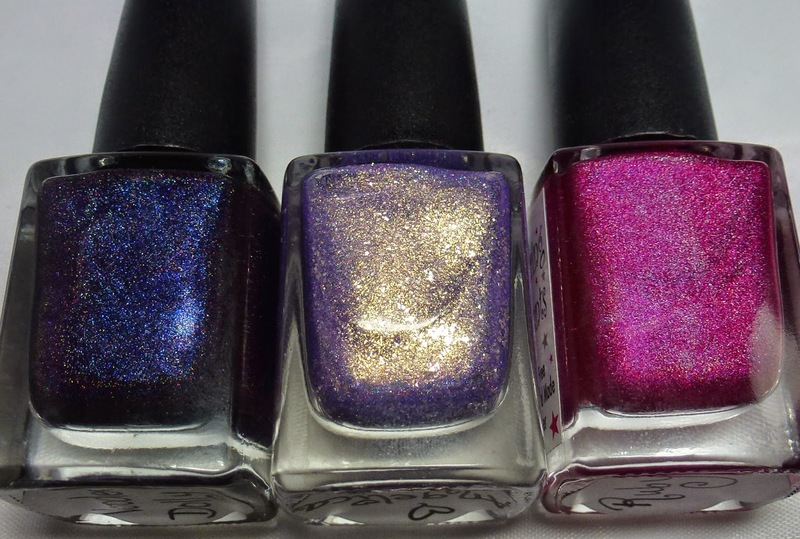 Dots were done with Glittering Elements Voodoo Dolly, Angelica (a Norway Nails exclusive) and Ruby, and Too Fancy Lacquer Rosé By The Dozen, Lake Como, and Come To the Dark Side. and Too Fancy Lacquer Rosé By The Dozen, Lake Como, and Come To the Dark Side. 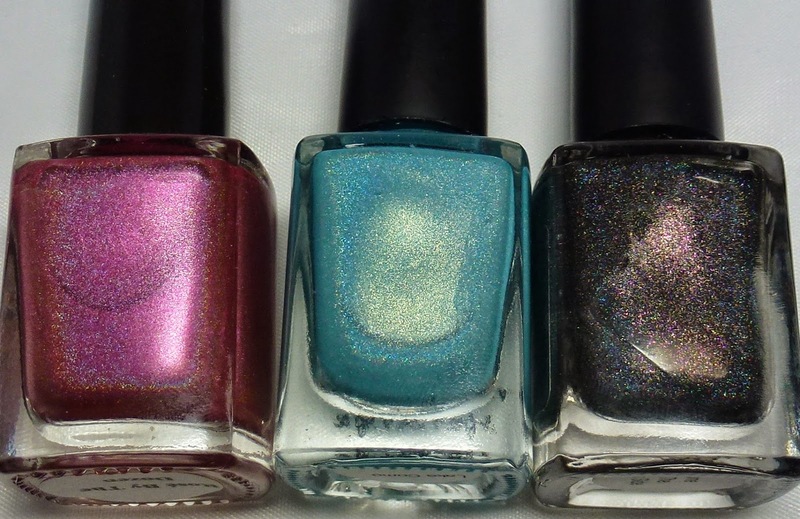 I decided to try a different design on each nail, like a sampler, to learn how it worked and see how the various polishes performed. Some of them turned out a bit better than others, but hey, I'm learning something new! This is not something I would probably wear all at once, but it was a great way to experiment. I'm pretty happy with how the pinky finger came out, with slightly graduated dots on an angle. Maybe I'd give myself a B on this one. The simple combo of pink and purple on the ring finger worked color-wise, but let's just say I could use a bit more control over my dot size and shape. A C+ perhaps? The middle finger was not a win in my book. 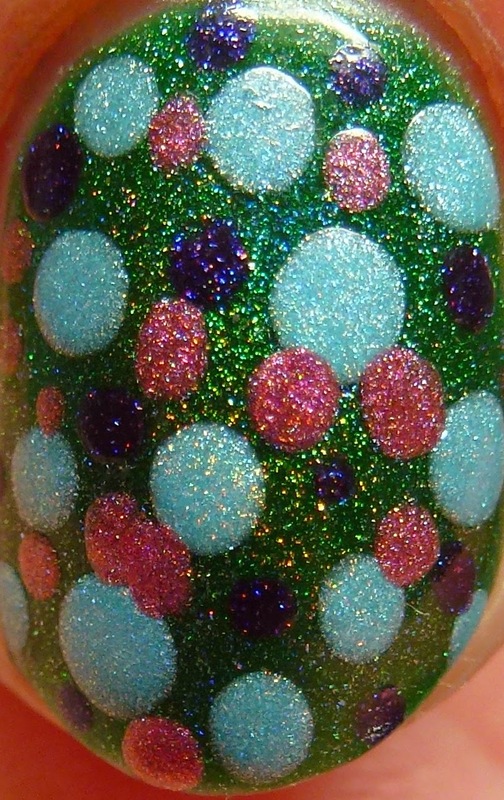 One of the dotting colors is a bit too dark for the base and the other is not quite opaque enough. Blah on the whole. A D+. 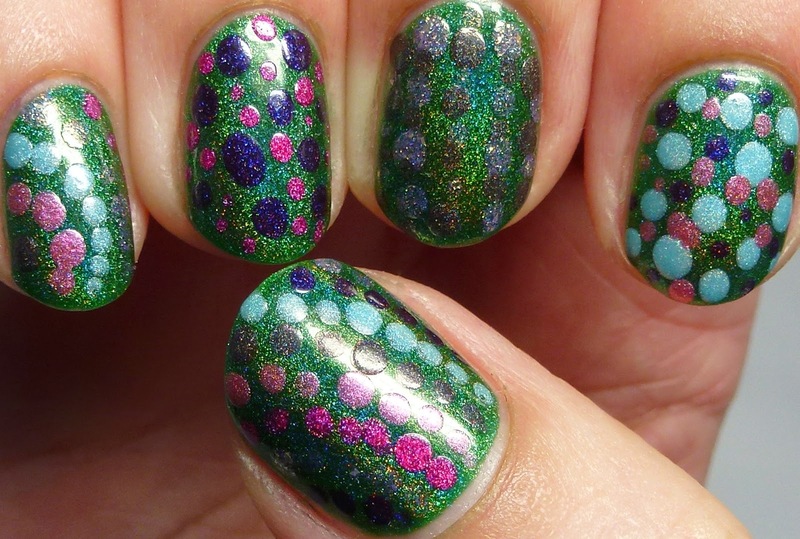 The index probably turned out the best of my random dot nails, with a total of three colors for variety and different size dots. Having enough contrast between all the colors used made it pop more. This one is a B-. I saved the best one for last! 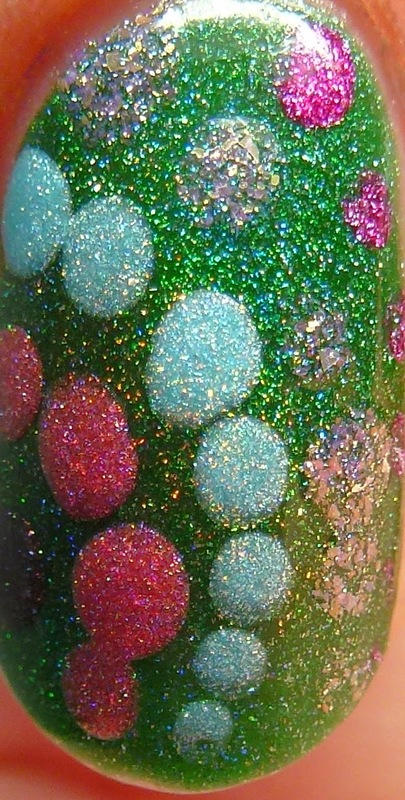 The thumb gave me a bit more room to work and I loved the curved lines of dots in different colors. This one I might try again, but only using the most opaque colors. It's a B+ I would say. I hope you enjoyed my first tentative journey into nail art as an adult. I did all kinds of experiments as a kid, but I doubt many of them were quite presentable. I don't think I'll be dotting or doing other types of nail art as a stable of my mani repertoire since I tend to prefer simple things on my nails, but I would like to improve my skills. Hats off to all of you who have mastered nail art, and for those of you who were timid like me, give it a chance, it's only a little scary at first! Thanks for having me, Babi! I give you an A !!!! You went outside your comfort zone and did great!!! I'm just now seeing this - awesome!! !